It’s sunset in Arizona. The photos above show my view to the East (upper) and the West (lower). In the upper photo, note the striking color difference between the foreground hill and Daisy Mountain in the background. The hill appears its normal green-brown color, but Daisy Mountain looks red-brown. What’s happening here? 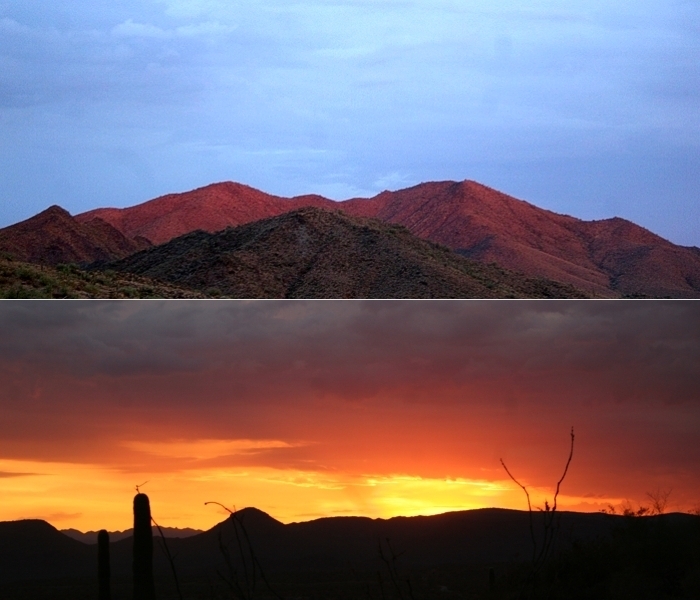 That color difference lasted for just a few minutes, after which both hill and mountain faded into darkness. During the brief period when the color difference was seen, the Sun was no longer visible from the hill, but was visible from the mountain. Daisy Mountain is about 300 meters (1000 feet) higher in elevation than the foreground hill. If you were standing on the summit of Daisy Mountain, you’d see the Sun just as it was setting. If you were standing on the summit of the hill, you would not see the Sun, and it would already be night (or more properly, “dusk”). The excess of red light near sunset is well understood. See my July 1, 2011 post. But when you live near mountains, the interplay of light and shadow can produce interesting effects like this. That foreground hill is in the Earth’s shadow, but as the Sun sets, Earth’s shadow moves upward, progressively covering higher elevation terrain. So what you’re seeing in this photo is not a terribly complicated phenomenon. It’s just one of those things you notice when you watch the sky as much as I do. No equations this week — just a pretty picture, explained.